« Cool Down With Snowman Earrings! Sterling necklace made with a variation of the Byzantine weave. Chain maille (also spelled chain mail) is weaving chains and sheets by using rings. Traditionally, this was done using metal rings, although today’s patterns can make use of jump rings made of metal, fabric, beads and rubber or plastic. It’s a brave new world! Before you run out and buy a bunch of jump rings, you need to be aware of their aspect ratio. You can buy rings from all kinds of places, in all kinds of metals and in a rainbow of colors. You can get rings made with precious metals (silver, gold) or base metals (pretty much anything but silver or gold). When learning how to do chain maille, you may want to start with an inexpensive metal such as copper, which is also relatively soft (and therefore easy to open and close). Aluminum is nice and light (and can also be andonized in several colors), but it can be stiff and tough to close in thicker gauges, until you are used to the stiffness. Wire Gauge: thicker gauges make thicker weaves, which is nice when you want a substantial piece of jewelry. But for some projects, like earrings, you may want a finer, lighter gauge. 18 and 20 are the most commonly-used gauges in jewelry. Diameter: To calculate AR you need to know the inside diameter (ID) of the jump ring. However, sometimes you only get the measurement for the outside diameter (OD). Yikes! Material: Are you making a casual piece of jewelry or something extra-special? When it comes to chain maille, almost anything goes. Special pieces may call for precious metals. Casual jewelry is fun in colors. Cut: I go into it more in the free ebook below, but how the jump ring is cut off the mandrel is important. With precious metals, you want rings that are saw-cutl other ways of cutting will have one end of the jump ring that is flush, and the other cut end will have a slight point. What to look for when buying jump rings. The two main wire measuring standards and how they differ. AR Chart — Gauge, ID, OD and AR for common gauges and sizes of jewelry. Examples of chain maille weaves made with different ARs. Mini-tutorial for a 4-in-2 weave. THANK YOU, THANK YOU, THANK YOU!!! Finally a book that I understand. AR is something I have had a hard time figuring out, but your explanation and chart helped alot. Now I can finally get the right rings for all those projects I have been putting on hold. Again, Thank you. 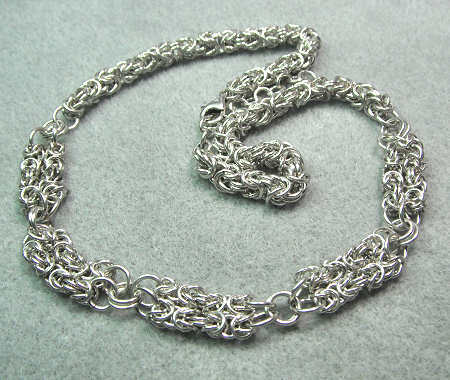 do you have a tutorial for the byzantine pattern chain maille?